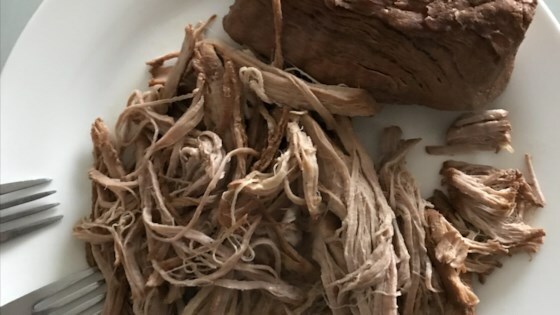 "Quick and tasty barbeque pork is made quickly using a pressure cooker for sandwiches or perfect alone!" Season the pork with garlic powder, salt and pepper; place into a 4 to 6 quart pressure cooker. Fill with enough water to cover. Close the lid and bring up to 15 pounds of pressure. Cook for 1 hour. Release the pressure and drain off juices, reserving about 2 cups. Shred the pork and mix with barbeque sauce, adding reserved liquid if needed to reach your desired consistency. To add a bit of southern flare, rub the pork with bbq rub of your choice and put in the oven at 450 for 35 minutes before putting in pressure cooker! This gives a better color and flavor! Very good, we made with a 4 pound pork roast, but cooked for 90 minutes. I think another 15 to 20 minutes would have made the white meat fall apart easier, but overall we were very satisfied. My family absolutely loved this recipe. My teenage son said can we have these instead of sloppy joes from now on. It was so easy. Loved it!! !